For other uses, see Saugerties, New York (disambiguation). Saugerties (/ˈsɔːɡərtiːz/) is a town in Ulster County, New York, United States. The population was 19,482 at the 2010 census. The Town of Saugerties contains the Village of Saugerties in the northeast corner of Ulster County. Part of the town is inside Catskill Park. U.S. Route 9W and New York State Route 32 pass through the town, converging at the center of the village and overlapping to the south. These routes parallel the New York State Thruway (Interstate 87), which passes through the town just west of the village. In the 1650s, Barent Cornelis Volge operated a sawmill on the Sawyer's Kill, supplying lumber for the manor of Rensselaerswick. He had secured a title from the Esopus Sachem to this lands sometime before 1663. Volge likely left the area at the outbreak of the first Esopus War in 1658. The "footpath to Albany" was not laid out until 1670. In April 1677 Governor Edmund Andros purchased land from the Esopus Indian Kaelcop, chief of the Amorgarickakan tribe for the price of a piece of cloth, a blanket, some coarse fiber, a loaf of bread, and a shirt. The Mynderse House was built by John Persen, formerly of Kingston, an early mill owner, around 1685. In October 1710, 300 families who had immigrated to England from the Palatine region of Germany established camps on the east and west side of the Hudson. The camp on the west side of the river became known as West Camp in the Town of Saugerties. They were sent by the British government to manufacture naval stores for Her Majesty's fleet. The villages at West Camp were called Elizabethtown, Georgetown, and Newtown. Sawmills were established on the Esopus Creek. In 1998 a monument commemorating their arrival was erected on the lawn of St. Paul's Lutheran Church in West Camp. Sometime before 1730 the Katsbaan area northeast of the village was settled by Dutch farmers from Kingston and Palatines from the "Camps". In 1732, they built a stone Dutch Reformed Church. During the American Revolution, a British Squadron lay anchor at Saugerties from October 18–22, 1777, while raiding parties burned Clermont and Belvedere, across the Hudson River. These were the estates of Margaret Beekman Livingston and her son, Chancellor Livingston. The British also burned sloops near the Esopus Creek, and several homes and barns. While here, British General Vaughan learned of Burgoyne's surrender at Saratoga on October 17. On October 22, 1777, the British fleet left from the Mid-Hudson Valley, never to return. The town was organized from the town of Kingston on April 5, 1811. At that time the hamlet of Saugerties contained twenty-one houses. Henry Barclay (1778-1851), was an importer from Manhattan who, with his wife Catherine (1782-1851), came to Saugerties about 1825. Barclay, who had business relationships with Robert L. Livingston, had a dam constructed on the Esopus Creek near today’s 9W bridge. Around 1828 he established the Ulster Iron Works to produce bar and hoop iron. It had a capacity for manufacturing about 6,000 tons annually. and employed about 300 hands working round the clock shifts. In 1830 Henry Barclay built a paper mill powered by water from the Esopus Creek, which at that location had a fall of thirty-one feet. Barclay imported skilled workers and engineers from England to man his mills. Upon Barclay's death in 1851, the mill was taken over by the Sheffield Company. The Sheffield Paper Mills, of J. B. Sheffield, manufactured writing paper. There were two buildings. They were rebuilt in 1860 by Messrs. White & Sheffield, and again rebuilt in 1868-9. The mills produced two and a half tons of paper daily, and employed about 130 people. William Sheffield built the Clovelea mansion around 1880. In 1888 Martin Cantine built a paper mill on the North side of the dam, and in 1903, the Cantine Company bought out the Sheffield mill. The Cantine mill closed in 1975. Part of the complex has been renovated as senior citizen housing. The village was incorporated in 1831 as "Ulster," and changed its name to "Saugerties" in 1855. In 1832, blue stone was quarried in nearby Toodlum (now Veteran).At one time, 2,000 men were employed in quarrying, dressing and shipping about one and a half million dollars’ worth of blue stone annually from Glasco, Malden, and Saugerties. Blue stone was used for curbing, paving, door sills, and window sills: much of it in New York City. The Ulster White Lead Company at Glenerie produced nine hundred tons of lead each year. By 1870, the population of the town of Saugerties was about 4000. The ice industry thrived during the 1880s to 1900′s. Icehouses were located in Glasco and Malden. Ice was also harvested on the Upper Esopus and on the Sawyerkill. The brick industry also began in Glasco. In the early hours of November 9, 1879, the steamer Ansonia of the Saugerties Line ran against the Lighthouse dock on its return trip from New York, smashing the paddle wheel. A tug from Kingston hauled the steamer off the flats, and it was taken to New York City for repairs. In 1889 Robert A. Snyder, John and George Seaman, Henry L. Finger, and James and William Maxwell started the "Saugerties and New York Steamboat Company". In 1892, the steamboats M. Martin and Tremper arrived at Saugerties at the same time, and collided near the lighthouse as each tried to get to the dock first. IN 1903, the steamboat Saugerties, burned to the waterline and the charred remains were scuttled in the cove north of the lighthouse. The remains can sometimes be seen at very low tides. In 1890 the Orpheum Theater was built by John Cooper Davis. It was a center for movies, basketball, vaudeville acts and roller skating. Lucille Ball, and Burns and Allen performed at the Orpheum. In 1906 Poultney Bigelow, editor and co-owner of the New York Evening Post, built Bigelow Hall in Malden. In April 1910, the Esopus Creek flooded the village of Saugerties. The Hudson Valley Garlic Festival was established in 1989 by Pat Reppert of Shale Hill Farm and Herb Gardens. In 1992, the Kiwanis Club of Saugerties took over sponsorship of the festival and moved it to Cantine Field where the festival is held on the last full weekend of every September. It attracts about 50,000 people during the two-day weekend. In 1994, Saugerties was the home of the Woodstock '94 music festival, held on the 25th anniversary of the original Woodstock Festival. Saugerties is just 9 miles (14 km) east of the town of Woodstock, New York. The original festival was held some 46 miles (74 km) west-southwest of the town of Woodstock (on Max Yasgur's farm in Bethel, New York), while the 1999 festival in Rome, NY was 106 miles (171 km) away from Woodstock. HITS ("Horseshows In The Sun"), opened in 2003. They occupy 200 acres (0.81 km2) of land and have a 10-ring, Olympic-sized horse show facility in central Saugerties. In 2014, Saugerties was home to the Hudson Music Project- which notoriously became known as the "Mudson Project". After 2 days of music and other festivities, the festival came to an abrupt halt on the third and final day as rain and mud overcame the concert and camp areas. Hundreds were left without food and water when their cars became stuck in the muck that dominated the camp ground. When the rain subsided, many campers stayed and continued to party through the night. Catholic laborers, principally quarrymen of Fish Creek, also known as "The Clove", were accustomed to go on Sundays to St. Mary of the Snow, in the village, for Mass, and sometimes disorders ensued. At that time the Saugerties congregation was served by Father Michael Gilbride, pastor in Hudson. Mr. Russell, owner of the quarries offered Gilbride land for a church, and St. John the Evangelist was established. Riverby: estate of American naturalist John Burroughs (1837-1921). Burrough's study at Riverby is a National Historic Landmark. Located in West Park, which is in the town of Ulster. 2 towns/cities away from Saugerties. Construction began on the original lighthouse in 1835 to guide ships away from shallows and into Esopus Creek. It was built on a pier made of chestnut cribbing filled with stone. The original source of light came from five whale-oil lamps with parabolic reflectors. It burned down in 1848. It was rebuilt by 1850, with four mineral-oil lamps, replacing the whale oil lamps. In 1867 Congress appropriated $25,000 for the construction of a new lighthouse. It was built on a circular stone base, 60 feet (18 m) in diameter. The mineral-oil lamps from the original lighthouse were moved to the new building. Two years later in 1869, the newly built lighthouse became functional. In 1873, a lantern room made out of cast-iron was installed with an iron-plate walkway that wrapped around for cleaning the outside panels of glass. In 1888 Saugerties harbor was dredged to improve access to the Esopus Creek. A small jetty was constructed from the fill linking the lighthouse to the mainland. In 1909, a fog bell was installed in the lighthouse. In the late 1940's, telephone, electricity and steam heat were added. In 1954, the automation of light made light keepers unnecessary so the Coast Guard closed the lighthouse. The Saugerties Lighthouse Conservancy was established in 1985 with the mission to restore and maintain the lighthouse. After extensive restoration, it was recommissioned by the Coast Guard as an aid to navigation. The foundation for the original lighthouse remains as a small island adjacent to the existing lighthouse. The town has a total area of 100.0 square miles (176.2 km²), of which, 64.5 square miles (167.2 km²) is land and 3.5 square miles (9.0 km²) of it (5.13%) is water (United States Census Bureau statistics). The north town line is the border of Greene County, New York, and the east town line, marked by the Hudson River, is the border of Dutchess and Columbia counties. Esopus Creek enters the Hudson River south of Saugerties village. In 2016, a Kingston Creative study of social media data found that the Catskill Animal Sanctuary, Opus 40, and HITS were the most-Instagrammed locations in town, indicating that they were the leading drivers of tourism. As of the 2010 census, there were 19,482 people; 8,163 households and 5,193 families residing in the town. The racial makeup of the town was 94.2% White, 1.7% Black or African American, .03% Native American, 1.1% Asian, .87% Pacific Islander (U.S. Census), and 2.10% from two or more races. Hispanic or Latino of any race were 5% of the population. Of the 8,163 households, 26.7% had children under the age of 18 living with them, 47.9% were married couples living together, 10.8% had a female householder with no husband present, and 36.4% were non-families. 29.3% of all households were made up of individuals and 29.3% had someone living alone who was 65 years of age or older. The average household size was 2.37 and the average family size was 2.92. In the town, the median age was 42.9 years; 7.3% are over 65. Henry Sherman Backus, the "Saugerties Bard", (1798–1861) itinerant composer of ballads. Joe Sinnott, Marvel Comics artist, Sinnott illustrated the Treasure Chest educational comic book series. Jimmy Fallon, host of NBC's Tonight Show since 2014, grew up in Saugerties from age two (born in Sunset Park, Brooklyn). The Band resided in a house known as 'Big Pink' in West Saugerties while recording The Basement Tapes (with Bob Dylan) in 1967. Their debut album, Music From Big Pink was recorded in New York City and Los Angeles. Jeremiah Russell, (1786–1867) U.S. Representative from New York. Adam Adamowicz, video game concept artist, he visualized the world in Fallout 3 and The Elder Scrolls V: Skyrim at Bethesda Softworks. Stuart Spector, American luthier, founder of Stuart Spector Design. Designs widely renowned Spector bass guitars. Tomas Penning (1904-1982), Sculptor, known for Our Lady of the Hudson overlooking the Hudson River in Port Ewen, NY. Asbury – A hamlet near the north town line, bordering the town of Catskill. Barclay Heights – A location in the southern side of the village on Route 9W. Blue Mountain – A hamlet in the western part of the town. Canoe Hill – A hamlet north of Saugerties village. Centerville – A hamlet west of Veteran. Eavesport – A hamlet on Route 9W north of Saugerties village. Fish Creek – A hamlet southwest of Saugerties village. Flatbush – A hamlet in the southeast corner of the town. Glasco – A hamlet in the southeast part of the town by the Hudson River. Glenerie – A hamlet in the southeast part of the town on Route 9W. High Woods – A hamlet in the southwest part of the town south of Fish Creek and West of Mount Marion. Katsbaan – A hamlet northwest of Saugerties village, located on County Route 34. Malden-on-Hudson – A hamlet by the Hudson River, north of Saugerties village. Mount Marion – A location in the southeast part of the town. Mount Marion Park – A hamlet west of Glasco. Quarryville – A hamlet west of Katsbaan on Route 32. Petersons Corner – A location south of Fish Creek. Pine Grove – A location west of Centerville. Saxton – A hamlet in the northwest corner of the town on Route 32. Saugerties – The Village of Saugerties is located in the eastern part of the town on Route 9W. Saugerties South – A hamlet south of Saugerties village. Commonly known as Barclay Heights. Shultis Corners – A hamlet in the southwest part of the town at the intersection of Glasco Turnpike and State Route 212. Veteran (aka Toodlum) – A hamlet west of Saugerties village. West Camp – A hamlet on Route 9W north of Eavesport. West Saugerties – A hamlet near the west town line, west of Blue Mountain, near Platte Clove. ^ a b c "Village Of Saugerties: History (Village): History (Village) [Digital Towpath]". village.saugerties.ny.us. Retrieved 2 April 2018. ^ a b "Town Of Saugerties: History (Town): History (Town) [Digital Towpath]". saugerties.ny.us. Retrieved 2 April 2018. ^ a b c "Saugerties History Time Line". www.hopefarm.com. Retrieved 2 April 2018. ^ a b "Shafer, Steve. "A short history of the Parish", Trinity Episcopal Church, Saugerties". trinitychurchsaugerties.org. Retrieved 2 April 2018. ^ Yasinsac, Rob. "Hudson Valley Ruins: Sheffield Paper Company, Saugerties, by Rob Yasinsac". 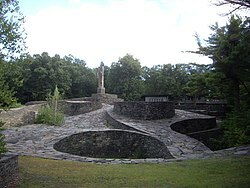 www.hudsonvalleyruins.org. Retrieved 2 April 2018. ^ a b c ""A History of Saugerties (1677-1899)"". saugerties.us. Retrieved 2 April 2018. ^ "Garlic Festival History". hvgf.org. Retrieved 2 April 2018. ^ a b "Timeline – Saugerties Lighthouse". www.saugertieslighthouse.com. Retrieved 2 April 2018. ^ "Saugerties' 12 Most-Instagrammed Places". kingstoncreative.net. 12 November 2016. Retrieved 2 April 2018.